I am not a brewer, not even a home brewer so I am terrible at telling what type of hops are in a beer unless it is a single hop beer like Hill Farmstead and some other breweries are doing. This is a great way to try the flavors from the hops individually. Citra is one of my favorite hops and I loved Hill Farmstead’s Double Citra which is an imperial pale ale using only Citra hops. It’s no surprise that I also liked this one a lot. Appearance is better than the photo with a hazy orange color and bright white head. Aroma has lots of citrus, grapefruit and smells hoppier and than most IPAs. Lots of tropical fruits happening in the taste and this beer is amazingly smooth and sessionable. 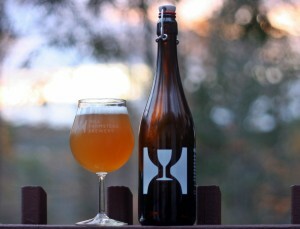 Another fantastic beer from Hill Farmstead! Brewers Description: An American Pale ale bittered, flavored, and dry hopped exclusively with Citra hops from the American Pacific Northwest.